The Hobbyzone Super Cub DSM is the perfect electric beginner plane. Comes absolutely complete with a transmitter and ready to fly. 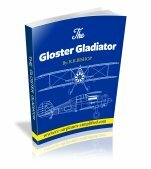 This is the latest version of maybe the best of all the beginner radio controlled planes available today. It is a trouble free electric airplane that comes 100% complete and ready to fly for less than $200.00. Many, many pilots have learnt to fly with the Hobbyzone Super Cub and this latest version is by far the best! It now includes the latest 2.4GHz radio technology. 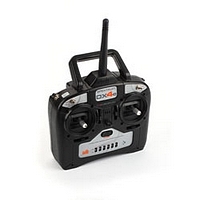 The transmitter, included in the box, is a Spektrum DX4e 4-channel DSMX transmitter. Note that the model is only a 3-channel airplane. There are no ailerons, just rudder, elevator and throttle control. This means that you can use the transmitter on future 4-channel, 2.4GHz, airplanes. Many models are appearing in the BNF style and your 4 channel transmitter can be used! Construction wise, the Super Cub is made from Z-foam. This is an injection molded foam, that can be easily glued back together, using foam safe CA or epoxy glue. If this is your first attempt at RC flying, then I am sure you will have your share of accidents! Remember that when a crash does happen, to save all the pieces and take them home. 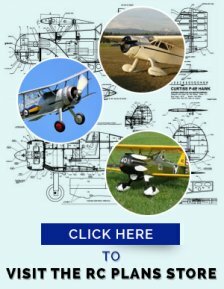 There you can take your time and repair things as accurately as possible and get your Hobbyzone Super Cub back in the air. If new parts are required, then they are readily available. Assembly consists of charging the lithium polymer batteries (3S, 11.1V 1300 mAh) Bolting on the tail and connecting the clevises. When the battery is charged it is time to fly! 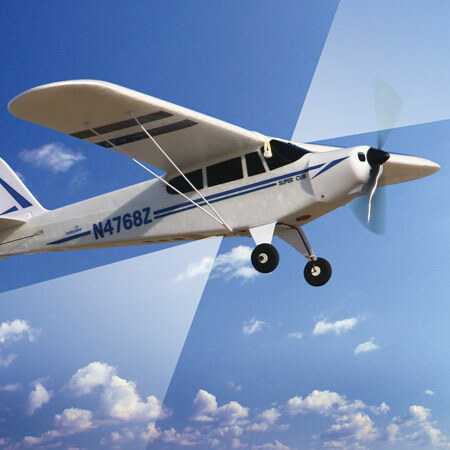 The Super cub comes complete with transmitter, lipo battery, balanced, DC, battery charger,1.5A 120V charger adaptor, 480 electric motor and even dry cells for the transmitter. There is nothing extra to buy except for maybe a spare lipo battery to allow shorter periods between flights. The charger adaptor allows charging the lipo batteries from an AC outlet and of course the DC charger allows charging from your car. The video has some nice flying shots and does show a lot of the options. The Hobbyzone Super Cub also has a feature known as "Anti Crash Technology" or ACT. This system is operated by 2-sensors, one on the top of the fuselage and a second on the bottom. The system will only operate above altitudes of 200ft. 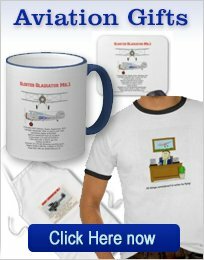 As long as you have a smooth surface to operate from, you will be able to taxi the Hobbyzone Super Cub with precision via the steerable tail wheel. To move about on the ground, keep some "up "elevator on and steer with the rudder. Keep the throttle low or give short bursts of more power to overcome minor obstacles, such as longer grass. When you are ready to take of (always into the wind) slowly advance the throttle, initially keeping a bit of "up" elevator, to keep the tail on the ground and steer straight with rudder. release the elevator and the tail will rise. Slowly add more throttle and and gently add a touch of "up" elevator and you should be flying! This sounds difficult and it is! Maybe the only criticism I have of the Hobbyzone Super Cub as a beginner RC plane, is that it is a tail dragger! Nose wheel steering makes take off and landing a lot easier. It is maybe a lot safer and easier, for the first few flights, to hand launch the Cub. If you have an assistant, tell them to keep the nose slightly down and launch with a smooth action, straight into the wind. Before signaling for the launch, got to almost full throttle and keep the inputs small and smooth! Try to keep straight and gain altitude. Throttle back to about 60% throttle to slow things down. When a turn is started, the nose of the Hobbyzone Super Cub will drop, so add a little "up" Try and fly in a "racetrack pattern". When you are more experienced fly in a horizontal figure eight pattern. this will ensure you can fly left and right hand turns. Landing and take off are the two compulsory maneuvers required in every flight! 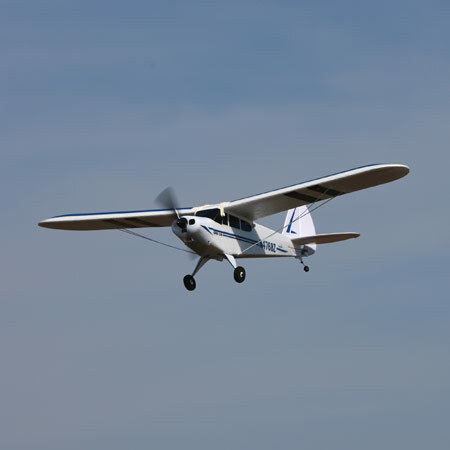 The landing can be practiced at altitude and you can try to get the plane over the runway and flying at a slower speed. The landing can be split into three positions. The downwind leg, the crosswind and the final. On the downwind leg, throttle back and start descending a little. Keep the turn onto the crosswind leg as flat as possible. Continue to gradually descend. The last turn, onto final, will hopefully be lined up with the center of the runway. Minor corrections to the heading can be made now. If you are too far out, slowly advance the throttle and go around. If you are lined up, keep the wings level and do not reduce the throttle too far. You should be at about 50%, at this point. Of course the Hobbyzone Super Cub is heading towards you and rudder controls are apparently "reversed". As long as you have practiced on the simulator, you should be OK with this aspect. For more information on the RC Flight Simulator, look at this page. Anyway, back to that landing! As you cross the threshold of the runway, you should be at about 10-15 feet high. Now reduce throttle to 25% and start to level off by adding a small amount of "up". The descent should continue, with the nose level and the final flare of "up" should have you lightly touching the main wheels. Good landings take a lot of practice- but it is also a lot of fun! When you make that perfect landing, the feeling you get is what this hobby is all about! I did not intend to go into as much detail on learning to fly the Hobbyzone Super Cub, but now you know the basics and please get an RC Flight Simulator and practice, practice, practice! A set of floats is also available for water take off and landing. Please note that it is recommended that you learn to fly first before trying flying over water. The floats also come with a different prop. the standard propeller is a 9x6. 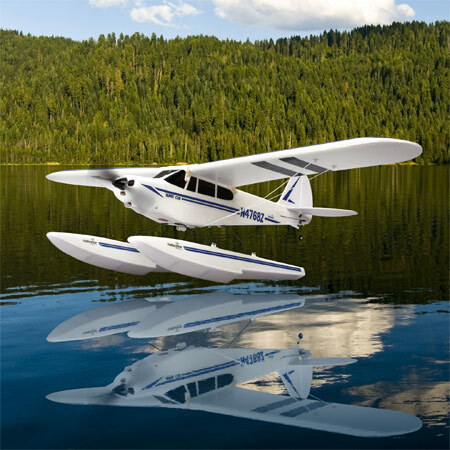 For float flying, a 10x8 will give more power for water take-offs. The fuselage has the mounting for the floats built in and the mounting gear is included with the floats. 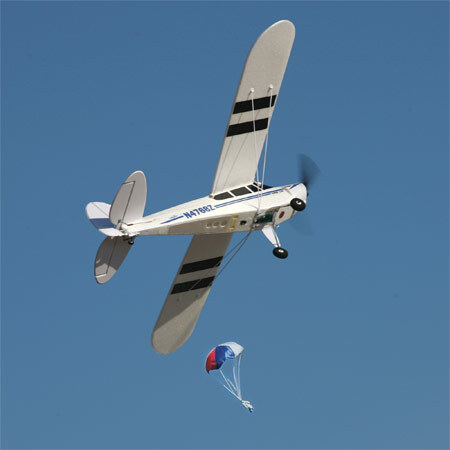 By using a feature called the X Port, a bomb or parachute drop can be used. Extra parts must be purchased for these options. This transmitter incorporates the latest 2.4Ghz technology. Manufactured by Spektrum, it is a 4-channel unit. You can use this transmitter on many BNF models in the future. You will never have to be concerned with other flyers being on your frequency and interference should be a thing of the past. Trim levers are featured on each channel and reversing switches are provided for all 4 channels, A dual rate switch is on top of the case along with the ACT on and off switch. It is possible to use this transmitter as a buddy system for training. This feature allows hooking up to a more experienced flyer's transmitter who can then transfer control between teacher and student. There is also a feature that allows "elevon" control for delta wing and "V" tailed aircraft. The transmitter uses dry cells for power. I would seriously consider changing to NiMH batteries. 100% complete and ready to fly! Proven design especially intended for beginners. Everything required is in the box. 4-channel transmitter can be used with other BNF models. Rubber band wing attachment is very forgiving and can save an airplane, in a "cartwheel" style of landing! Motor is brushed and not the latest outrunner brushless motor. Tail dragger landing gear is more difficult to learn than a tricycle gear. The majority of the reviews for the Hobbyzone Super Cub were very complimentary. They all commented on the easy flying characteristics. The ease of repair with epoxy or foam safe CA was mentioned a number of times. The large size was also noted, this means that a slight breeze can be handled and the model is easier to see. Flying in calm conditions was mentioned a few times as being much preferable. A good tip was to buy a spare prop and cowl. These parts are vulnerable in the inevitable crashes and if you have them on hand then down-time will be at a minimum.